Mayan Indians are associated with many legends and mysterious stories, but the researchers pay special attention to the ancient calendar of this mysterious civilization. The Mayan civilization began to form in Central America as early as 2000 BC. The culture of this people has always attracted the attention of scientists thanks to the perfectly developed mathematical and astronomical sciences, hieroglyphic writing, unusual architecture, knowledge of agriculture and other achievements in art and crafts. 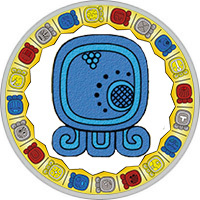 An integral part of the Mayan calendar is the Mayan horoscope, which is based not on the movement of planets and stars, on which modern astrological horoscopes are known, but the energy rhythms of the universe. That is why the signs of the Mayan horoscope are replacing each other more than once a month (as in the Zodiac horoscope), and more than once a year (as in the Eastern calendar), but daily. One of the features of the calendar-horoscope Maya is that it is based on a cycle of 260 days, which in turn consists of 20 periods of 13 days. Every day horoscope Maya, in accordance with the diurnal motion of the Earth, has its own name and sign, which determines everything that happens at this time. Surprisingly, even global events fully correspond to the character of the sign under the influence of which the time period is located. Since the Mayan horoscope consists of a 260-day cycle, and this determines his second feature: people born in the same day of the month with a difference, even in one year, will be under the control of different characters Maya calendar. That is why to determine your horoscope sign Maya to modern man, accustomed to the 365-day cycle and the annual cycle of the lunar calendar, it is difficult. The Mayan calendar is a unique tool that has come down to us through the dark ages. With his help the Mayan priests knew how to predict not only global events, but also the personal future of each person. At the moment of birth, we receive a charge of energy that affects our future life. The Mayan horoscope takes this influence into account and gives a full characterization to each of the 20 signs. To determine the sign of the Mayan calendar, under the control of which one or another day is located, calculations are made by special formulas using tables of correspondence of the modern calendar to the dates of the Mayan calendar. We suggest you not to bother yourself with long calculations, but use the online calculation form. Enter your date of birth and click the button to determine the sign of your birthday on the Mayan calendar, find out the meaning of its symbol, the characteristics of the people who were born that day. People born under this sign often feel themselves lost and helpless. Perhaps this explains their emotionality. At the same time, sparkling fantasies scatter from them. They have an incredible desire for constant activity. They just radiate creative energy and head to the most risky projects. These people have a constant need for security and coziness, from which they are very sensitive. They understand the disturbances and emotions of other people. Thanks to this line, they make excellent teachers and doctors. Children and family play one of the main roles in life of Imix Mayan sign. People of this sign love to patronize their loved ones. However, sometimes they can lose self-control and lose their temper. At such times they may turn away from everyone and go away to live in a world of their own illusions. People born under this sign have an ineradicable desire to change the world around them with the help of amazing deeds and creative ideas. They have strong spiritual and physical health. Versatile, talented and unpredictable. The people of the sign of Ik are, first and foremost, romanticists and idealists. They are very communicative, they are able to express simple and accessible even the most complex thoughts. Therefore, as a rule, everyone understands from the side. There are people in this sign and a disadvantage. It is the indecisiveness and total absence of a sense of duty. From difficult situations they try to simply "escape", shifting responsibility to someone else. You can not rely on such people. People who were born under this sign, all their lives balancing between conscious and subconscious worlds, in search of balance. They strive to achieve spiritual and physical harmony and stability. Try to create a comfortable atmosphere at home, as well as at work. Energetically they are weak, but they fill it with creative ideas and the ability to listen to intuition. Virtually all representatives of this sign are very conservative. They logically think and have good organizational skills. From such people are good organizers and thinkers. Quite often people of the sign of Akbal become self-absorbed, falling into reflections on the meaning of life. Sometimes this ends for them a sense of complete desperation, helplessness and apathy. People of the Kan sign can be described in one word combination — "natural disaster". For their thoughts it is simply impossible to have time. One crazy idea is instantly replaced by another. They need to learn to direct their energy in one direction. The self-sufficiency of representatives of this sign allows them to gain complete independence. They can not scare anything, except one — the future of time, which inexorably advances on them. Lizards are not persistent, which, however, does not prevent them from finding their own half. It is true that a large amount of time can be spent searching. But this way Kan will be held to the very end, despite any obstacles. A distinctive feature of the Maya sign of Chicchan is the snake, which is also compared with the milky way in the starry sky. The patron of the Chicchan is Kukulkan, he is also Quetzalcoatl. All representatives of the sign of the Milky Way has a developed physical condition, as well as a beautiful spiritual upbringing. But they are in dire need of general attention, which makes not hide, but on the contrary show all their experiences and sympathies. These people have some kind of mystical charm, which they skillfully use. Despite the fact that the representatives of the Chicchan are surrounded by many people, they diligently distance themselves from everyone, not allowing themselves to even close relatives. In many ways this is due to the inherent selfishness that is inherent in all people of the Milky Way. Being in a state of movement to something special, Chicchan quite often misunderstands what comes to their eyes, and from this their search can become truly endless. Cimi is a conductor from one world to another, wandering in search of something or someone. This is a sign of death, the patron of which is the ruler of Shibalba. The god of death Ahpuh gave each person who came into the world at this time, incredibly easy character, but they do not hinder to quickly move into a state of melancholy. Depression — that’s what accompanies Cimi their whole life, and it’s not accidental. They are hard at experiencing any trouble, even not directly touching them. Changes for people of the sign of Death are worse than terrible penal servitude, and the need for constant prosperity makes Cimi extremely unhappy. Conservatism is their desired way of life. But all this does not prevent them from being interesting to others and support any conversations. Spiritual and mysterious knowledge goes to them with incredible ease and simplicity. Rarely, but still there are among them even great magicians or astrologers who have achieved incredible successes in their field. The pride of the forests, endowed with regal grandeur — this all directly relates to the representatives of the Manik sign. He is guarded by Tohil himself, a deity in the image of this forest inhabitant — a deer. Energy overflows representatives of this sign, allowing them to do great things. They are characterized by incredible talent, artistry, as well as the ability to heal everyone around — gifts, which with great generosity gifted them to God Tohil. And this is not all the good qualities that are available to deer people: ease and naturalness in behavior allow representatives of this sign to find a common language in any company. But, despite this, in the depths of his soul, Manik suffers from loneliness. However, this does not spoil their relationship to others, because the nobility and generosity inherent in this sign, does not allow them to fall below the level of communication. This sign represents the celestial night star, which is the moon, so do not be surprised at the protection of the moon goddess Ichkhel and her assistant in the form of a rabbit totem-charm with a melodious name Nagual. What are the characteristics of the representatives of Lamat? First of all, it is not difficult to solve a difficult task or to get rid of an insoluble problem with a subtle cunning and a shrewd mind. However, before that they do not bring, because they choose the most optimal way in their lives, which allows to avoid any troubles. Many people of this sign become excellent healers, and also successfully study astrological and magical sciences. At the same time, all representatives of Lamat can not imagine another pastime, except work. Falling drops, water surface — so you should "read" this sign. 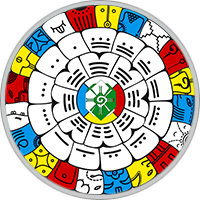 The main Maya raincoat, Chaak, is the patron saint of the people of the sign of Muluk. It is Chaak that gives his subjects a deep, penetrating mind with the purest thoughts. They have a very rich inner world. They are emotional and sensual people. Revolutionary ideas are constantly emerging in their minds, often bordering on fantasy. The distinctive quality of people born under the auspices of Chaak can be called their independence and the desire for complete independence. Nature generously endowed them with good qualities. Representatives of this sign are always under the close attention of others, and all because they often become participants in sensational and controversial events, for which the whole world is ready to watch. This sign of the Maya, Oc, entirely belongs to the dog. It is not accidental that his patron himself, the god Tzul, whose distinctive feature is the dog’s head. All representatives of the sign Oc excellently developed a sense of devotion. Faithful to their family, they delight not only loved ones, but also surrounding people. But in every barrel of honey there can always be a fly in the ointment — in Oc it is immense jealousy. This quality frightens and annoys most people. But do not be angry with the representatives of this sign, because all this happens only from the desire to be closer to those whom they strongly love. Family and friendly ties make Oc happy, relaxed. Willingness to come to the rescue allows people-dogs to become even closer to all their loved ones. But despite this, they themselves need constant protection and attention. Hunchuen, the monkey god, who is the patron of this sign, gave him part of his name as a sign of special disposition. Chuen gives each ward a special gift of sociability. Not for nothing does the people of this sign try to surround themselves with many acquaintances and like-minded people, gladly discovering new contacts for themselves. This is also promoted by talents, which Chuen quite a lot. Representatives of the monkey sign are surprisingly romantic nature, flirting or coquetry for them — like water for fish. But despite the frivolous frivolity, Chuen can carefully hide their secrets. They are usually old grievances, caused by heart experiences and failed intrigues. Nevertheless, this is the most successful sign, which almost does not know the defeats, and certainly not in the affairs of the heart. The constant struggle between light and dark is peculiar to the sign of Eb — the sign of the road. He is supervised by twin brothers Hunahpu — they also include a spare head, which is also associated with the sign of Eb. All the representatives of Eb are constantly in the process of achieving the highest ideas and plans, spending all their strengths and emotions on this, remaining completely devastated. Within themselves, the people of Eb feel vulnerability, which is amplified in the most severe trials that the gods have prepared for them. Despite all their aspirations, the representatives of the sign are rather restrained in life and with others. Anger and fury will bubble inside them like a volcano, but it will be incredibly difficult for them to break out, as the self-control of the people of this sign takes precedence in most cases. To do this, they need the inner harmony that Eb tries to draw from relationships with others. Fertile and majestic Reed — that’s what the sign of Ben means. Most often it is associated with the cob of this plant, which serves as the main source of food not only for humans, but also for those who surround it. It is no accident that the young deity Ben Reed is considered the patron of this sign. If in life you have met an incredibly creative person, then we can safely say that it will be Ben. The people of maize never leave their inspiration and desire for new achievements. For them, life is something endless, indestructible, permanent. The thirst for knowledge overwhelms the maize people, they have a huge number of different talents. Any restriction of one’s own freedom is unacceptable to them. Ben also has a tendency to change. The maize people need constant help, maintaining a balance between the cliffs on both sides of their lives. Children are jaguars or magicians who enjoy the protection of Ichkhel and Ichalance, who are the gods of the moon. Jaguar people have the ability to find the ray of the sun even where it was never. People Ix — subtle natures, penetrating into all corners of the world. Representatives of this sign have a very developed taste, they just go crazy with the desire to purchase a beautiful new thing. However, daily life is able to completely dislodge them, forcing them to experience helplessness and a sense of loss. But the children of Jaguar are easily transferred to the world of dreams and fantasies, going to distant travel, which draws their restless imagination. And in this, no one can hinder them, which is what representatives of the sign Ix use. Ancient Maya, knowing about the abilities and character of jaguar people, tried to direct them to the perfection of the spiritual essence. The only way to prevent the negative consequences of their rampant thoughts. The majestic eagle, the king of all representatives of the feathered world, identifies this sign of the Maya — Men. He is protected by the Sun God himself, namely Hunahpu-Ahau. People Men have a huge number of different virtues — they have a keen sense of intelligence, intelligence, vision, as well as the possession of talents, which others can only dream of. In general, they are so developed that it is difficult to imagine an area where they could not show themselves. A feature of the character of Men is love of freedom. Not having time to be born, eagles are already striving to become independent. People, taking an example from their sign, make an ascent to the highest peaks, trying to rise above everything that only sight gets in their field — and it is excellent for eagle people. But, unfortunately, as often happens in life, many can not stand the tempo and headlong down, "breaking" on the rocks of distrust and envy of those around them. The most insidious predators, such as a vulture or a kite, have become prototypes for this sign. And this is not accidental, since the patron saint of his is the keeper of the underground gardens — the Great Owl. Every representative of people Cib has exceptional talent, and all because the patronizing Owl generously endowed them with a lot of the best qualities. Charisma and sensuality are characteristic features of such people. Rich in knowledge and full of spiritual education, vultures easily compensate for the lack of physical development. But do not underestimate them, because if you make people-owls angry, they will show the fullness of their cunning and cunning. Knowingly the patron of the sign has an agile sharp beak, which is always ready to use for its intended purpose. Also, do not limit the freedom of these people — they will sooner or later achieve it, but only their detractors will not be able to recover from the received strikes. People who were born under this sign are very much connected to the land. They have a great opportunity to realize strong feelings and thoughts in creative areas, for example, in painting or in music. Such people know first-hand what inspiration is. Representatives of this sign can give good practical advice. But they will not insist on anything, show anything in practice. Sometimes people Caban too seriously perceive life, become impressionable and badly experienced criticism. In some cases, these people can completely close themselves from the outside world. At the same time, when they open themselves to the world, leaving the protective shell — they quickly begin spiritual growth and come to success. Values ​​for this sign is pretty much — a sword, a pyramid and even a flint are associated with it. The patron of Etznab is Kukulkan himself, who also has some other signs. God gave his wards the sharp and mighty intelligence that they use throughout their lives. The search for fresh ideas, solutions and new worlds does not prevent people from staying in Etznab practical and restrained. Diplomacy is the distinguishing feature of people of this sign, which they successfully use. A good relationship with everyone who does not surround them, allow the people of Etznab to find a common language and the right decision in any situation. With all these abilities and characteristics, people-flints never allow themselves to be offended. The beautiful half of this sign also has distinctive features — the girls and women of Etznab possess charming beauty, behind which a real iron character hides. This sign is closely related to the rumble of thunder, fire, rain clouds, because it is in the patronage of the great rain god Chaak. If a brilliant actor appears in the theater of drama, then he definitely belongs to the Cauac. But most often they are revealed not on the general review, but inside their own family. Rumble of thunder and arrows of lightning are falling upon all those who were not fortunate enough to be in the field of activity of the great "playwright". The play, where the main action will be a tragedy, storm people are ready to start any minute. Like a terrible hurricane, coming from nowhere, the Cauac suddenly starts to spew a lot of lightning and rain. But do not be scared ahead of time — gradually the storm passes, and after it appears the sun, let and for a while. Another distinguishing feature of these people is the constant depression. They can be in them because of the pursuing bad luck, which can become fatal, and to get them out of this state is extremely difficult. Representatives of this sign are associated with incense. The value for Ahau is power, in another interpretation the sun acts to them. The powerful god Kukulkan patronizes people born under this sign. As a rule, all Ahau are extremely gifted and have diversified development. Despite the fact that they can not be called adherents of idealism, they are rather refined and sensual natures. They aspire to an easy and bright life, constant joy of awareness of harmony. However, people around Ahau treat them with undisguised indignation. People of this sign quickly lose their way — if a person has "left the ground from under his feet", then this is a bright representative of Ahau. But they are gifted to learn many secrets, mystical secrets that will never be revealed to other people. Mages and prophets, that’s who is hiding under the sign of Ahau. One of the oddities of this calendar is that it is based not on a year and not a month, but a complete cycle of 260 days, or 20 periods of 13 days. More precisely, this 260-day cycle is the result of overlapping two cycles — a 20-day and a 13-day cycle. The days of the 20-day cycle have their names, which successively replace each other: first comes the day of Imix (Crocodile), followed by the day of Ik (Wind), then — Akbal (Night), etc. This cycle is superimposed 13 days, days in which do not have their names and differ only in numbers — from 1 to 13. The first day of the 260-day calendar circle is called Crocodile-1 day. Next come Day of Wind-2, Day of Night-3 and so on. When the day comes to thirteen, the account is updated and starts again with one. So, for example, after the day of Reed-13 follows the day of Jaguar-1. After a lapse of 260 days, the account is renewed from the beginning, that is, from the day of Crocodile-1. If a day has a numerical value of 1, it is considered the start of a new thirteen-day cycle. Each cycle is called the first day, since it is the first day that leaves an imprint on all 13 days of the cycle. Hence, it is clear that the cycles in the Mayan calendar have the same names as the days, but follow each other in a different order. The first is the cycle of the Crocodile (beginning with Crocodile-1), followed by the Jaguar cycle (the beginning of the Jaguar-1 day), then the Deer cycle (beginning on the day of Deer-1), etc. To determine what Mayan day and cycle falls on today, it is sufficient to know what sign it was yesterday. For example, if yesterday was the Lizard-3 day, today, accordingly, there should be a Serpent-4, tomorrow — Death-5, etc. Well, in order to know the cycle, you need to find the next day with the number 1 in the reverse order. In the case of Snake-4, the first day of the cycle is Wind-1, accordingly, the Day of Serpent-4 falls on the Wind cycle. 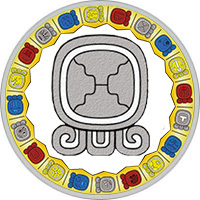 Traditionally, the beginning of our Mayan era was chosen as the day that according to the Gregorian calendar falls on August 11, 3114 BC. This is the beginning of the day Imish-5 (Crocodile-5, cycle Earth). Using this date as the starting point, you can determine which Mayan day and cycle falls on any date of the European calendar. Or, for convenience, to avoid confusion with the zero year (which was not in the Gregorian calendar) and other calendar subtleties, you can use any other starting point, for example: for the 20th century it is convenient to count from January 1, 1900 (Etznab- 4, or Flint-4, the Eagle cycle), and for the 21st century - from January 1, 2000 (day Ik-11, or Wind-11, the Skull cycle). So the Mayan calendar is arranged. In addition to these 260-day cycles, the Maya also counted longer cycles — tuna (360-day intervals), katuns (20 tuyas for 360 days, ie 7200 days), baktuns (20 katuns or 144,000 days). Finally, the whole epoch counts 260 katunas in Maya, that is, 5200 years (more precisely 5200 tones, which corresponds to approximately 5125 solar years). The last Mayan era was called the Fifth Sun and ended on the night of December 21, 2012. And what’s next? Next — the Sixth Sun.